flagships this holiday season. Both of them have very high-end specs, including high-resolution displays and powerful processors, along with a (perhaps too) high price tag. But which one is worth your money the most? The two tablets, despite both being flagships, compete at different price points, which explains partially why the Surface 2's specs aren't as impressive as the Galaxy Note 10.1's. These two flagship tablets feature some very nice designs to go with the powerful hardware inside them and their high prices. In terms of materials the Surface 2 has the upper hand, because while the Galaxy Note 10.1 has a plastic back with a special texture that makes it look like leather (aka faux leather), the Surface 2's internals are protected by a durable magnesium alloy the Microsoft calls VaporMg. That gives the Surface 2 a premium look over the Note 10.1, and it's more durable too. The faux leather on the Note 10.1 might be appealing to some, but to others, including me, the leather imitation is not attractive. Despite its high-quality materials, the Surface 2 just falls short of its competitors when it comes to its size and weight. It's inevitably larger, since the screen is 1/2" larger than its Android rivals and is 0.9" larger than the iPad's screen, so we can't blame Microsoft for that. Not only that, but it's also thicker than most recent flagship tablets (the Galaxy Note 10.1 measures 7.9mm thick, and the iPad Air is 7.5mm thick) and much heavier, weighing 676g versus the Galaxy Note 10.1's 540g and the iPad Air's 469g. Of course some of that extra weight comes from the larger dimensions due to the larger screen, but that doesn't excuse the Surface 2 for being that heavy. It's still quite comfortable to hold, but the Galaxy Note 10.1 will definitely tire your arms less when holding the tablet for an extended period of time. The Surface 2 also has considerably larger bezels than its rivals. Considering the size of the screen, however, the bezel size is quite appreciable. Of course, the Surface 2's built-in kickstand distinguishes it from all of its competitors. The new 2-stage kickstand is very useful, and is something you'd only be able to achieve on other tablets with covers like the iPad's Smart Cover, and considering the Surface 2's weight, you might find yourself using the kickstand more than you imagine. Also, one unique feature of the Surface 2 is its keyboard covers, which attach to the amazingly strong magnetic connector on the bottom side of the tablet and can also double as a cover for the screen. There are three options of keyboard covers, starting with the Touch Cover 2, which sells for $119 and this one features capacitive keys, which are now backlit, the Type Cover 2, which sells for $129, is thicker than the Touch Cover 2 with the benefit of having physical keys, which are also backlit. Finally there's the Power Cover, which will be available as of early 2014 for $199, and will be basically a Type Cover 2 with a built-in battery. Along with Microsoft Office RT 2013, the keyboard covers make the Surface 2 just about the most productive ARM tablet on the planet. The Galaxy Note 10.1 also has some productivity-oriented tricks up its sleeve with its S Pen digitizer, which comes included with the tablet and offers precise pen input for taking notes and other related tasks. Of these two tablets, it's the Galaxy Note 10.1 2014 Edition that has the better display. While the display is smaller, measuring 10.1" diagonally, it packs much more pixels than the Surface 2, with a stunning 2560 x 1600 resolution and a top-notch 299ppi pixel density. Samsung's display also has excellent viewing angles and reproduces colors vibrantly and accurately. The Surface 2 packs a slightly larger 10.6" screen with a resolution of 1920 x 1080, resulting in a pixel density of 208ppi. Microsoft uses its so-called ClearType technology in the Surface 2, which means that the touch panel and the glass are laminated to the display, reducing reflections and thus making the tablet's screen more comfortable to use in direct light or outdoors. The display also has wide viewing angles, and like the Note 10.1 also reproduces accurate and saturated colors, although the Note 10.1 is still slightly more vivid. The difference in the two displays' pixel densities is quite easily noticeable when viewing text. The Note 10.1 is just completely devoid of any pixellation, while the Surface 2, while still very crisp, does show some pixellation in text if you look closely. The two displays have slightly different aspect ratios. While the Note 10.1 is 16:10, the Surface 2 is even wider with a 16:9 aspect ratio. So while the Note 10.1 is noticeably less wide, both screen share the same benefits and problems, for instance, they're excellent for watching videos, but while the Note 10.1 would show a very small amount of letterboxing, the Surface 2 should be devoid of any letterboxing. Both are also quite awkward to use in portrait mode, but the Note 10.1 is arguably a bit less awkward to use in portrait. In any case, both displays are excellent, but the Note 10.1 certainly outclasses the Surface 2 in every way, even if by a little. As flagship tablets, both of them are equipped with the latest and greatest silicon. The Surface 2 has a Tegra 4 processor, while the Galaxy Note 10.1 goes with a Snapdragon 800 beast for the LTE variant or Samsung's own Exynos 5420 processor for the Wi-Fi only version. The Tegra 4 is NVIDIA's latest system-on-chip, and utilizes the 4-PLUS-1 architecture originally introduced in the Tegra 3, what that means is that there is one main CPU cluster, which is composed of four Cortex-A15 cores clocked at up to 1.9GHz with one core active (and 1.7GHz with more than one core active) and one additional shadow A15 core targeted for low frequency (up to ~825MHz) and low power consumption. When the CPU workload is very light, for example, when the device is idling, all processing transfers to the shadow core and the quad-core A15 cluster is power-gated, so that the shadow core can process these light tasks while consuming very low power, enhancing battery life. Performance-wise, the Cortex-A15 is one of the best performing mobile CPUs in existence, so CPU performance on the Surface 2 should be on par with the industry's greatest. 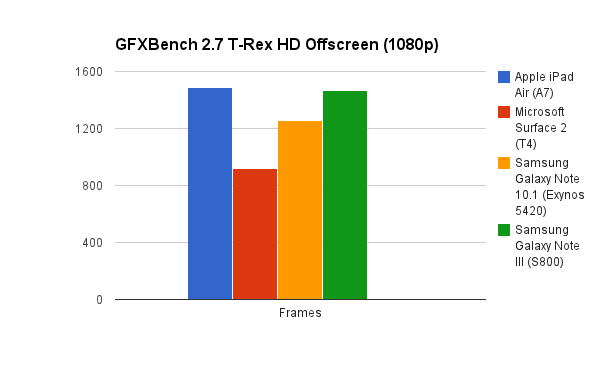 The GPU in the Tegra 4 is a bit more disappointing. The shader architecture is the only one in the current mobile industry that is discrete rather than unified, and mind you, that's the architecture that most similarly resembles the Geforce 6000 series (which is very old indeed). Basically this means that, instead of each shader in the GPU being able to process pixel or vertex instructions based on the workload, there are separate pixel and vertex shader units. With a total of 72 shader cores (48 shader, 24 vertex) with a pretty high clock speed of 672MHz, the Tegra 4 actually packs a lot of processing power, despite its old architecture. As benchmarks will show, Tegra 4's GPU performance is somewhat behind the Snapdragon 800 and the Exynos 5420 processors used in the Galaxy Note 10.1, but considering that the Surface 2's GPU needs to push roughly half the amount of pixels compared to the Note 10.1, they're actually well-balanced performance-wise. The Galaxy Note 10.1's Wi-Fi version is packed with an Exynos 5420 processor, more commonly known as Exynos 5 Octa. This processor uses ARM's big.LITTLE CPU architecture which, similarly to NVIDIA's 4-PLUS-1, has one high-performance CPU cluster and a second power-saving CPU cluster. The main cluster is very similar to the Tegra 4, containing four Cortex-A15 cores with a clock speed of 1.9GHz. Unlike the Tegra 4 though, which uses only one core in the power-saving cluster, Samsung went rather overkill and crammed in four low-power Cortex-A7 cores running at up to 1.3GHz. I'm not sure rather the Quad-core A7 @ 1.3GHz is more or less efficient in saving power than a single A15 @ 825MHz, but both solutions should have a similar effect on power consumption. In benchmarks, however, the Exynos 5420 is certainly very close to the Tegra 4, since their high-performing CPU clusters are practically identical. On the GPU side, the Exynos 5420 packs ARM's Mali-T628 GPU, which benchmarks prove to be a very powerful GPU and adequate for the Galaxy Note 10.1's high-resolution duties. Unlike the Tegra 4, the Mali-T628 is as modern as mobile GPUs go, as the shader architecture is unified and the GPU boasts full support of OpenGL ES 3.0. The LTE Galaxy Note 10.1 is equipped with the industry leading Snapdragon 800 processor. This CPU in the Snapdragon 800 is a Quad-core configuration of Qualcomm's own Krait 400 CPU core, running at a max clock speed of 2.3GHz. The CPU is power-efficient enough so that an extra low-power CPU cluster isn't necessary here. In fact, one interesting ability of the Krait 400 core is that each core can run at a different clock speed depending on the workload put on each core, unlike the Cortex-A15, which has the same clock speed on all active cores. What's the advantage of that? For example, if the current workload requires two cores active, using one at full power but only processing light tasks on the second core, a Cortex-A15 CPU would put both cores on their highest clock speed, say, 1.9GHz, even though the second core is processing a light task and doesn't need the full 1.9GHz, while a Krait core, with the same workload, would put the first core on full power, in this case, 2.3GHz, and the second core at a lower clock speed adequate for its current task, say, 1.0GHz. This unique feature really helps increase power efficiency, and renders extra low-power CPU cores unnecessary. In terms of performance, its high clock speed and its strong core architecture make the Snapdragon 800 one of the fastest CPUs around, if not the fastest. The GPU in the Snapdragon 800 is the company's own Adreno 330. Since Qualcomm never discloses information about its GPU architectures, I'm left with very little to say about it, however, we do know that, like the Mali-T628, it has a modern architecture, with a unified shader architecture and full OpenGL ES 3.0 support. In general, the Adreno 330 does perform a bit better than the Mali-T628, but its performance is still pretty close to the Mali-T628. Now, with all that technical babble about architectures out of the way, let's get to actually testing these processors' performance in benchmarks, starting with Geekbench 3, which measures CPU and memory performance. Note: The Galaxy Note 10.1's LTE edition isn't commercially available, so I had to take Snapdragon 800 benchmark results from the Note III, which runs the same software as the Note 10.1 and should therefore have almost identical results to the actual S800-powered Note 10.1. 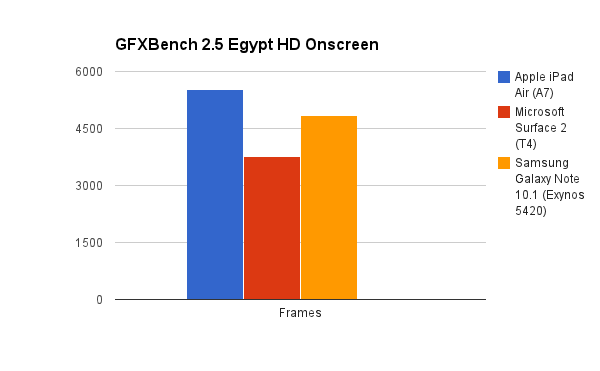 However, the difference in resolution (1080p vs 1600p) between the Note III and the Note 10.1 means I can't include onscreen GPU benchmark results for the Snapdragon 800. Note (2): Unfortunately Geekbench 3 isn't available for Windows RT, so I can't include results for the Surface 2, so I took the performance results from an Android tablet whose processor most closely resembles the Surface 2's, the ASUS Transformer Pad TF701T, which is powered by a slightly higher-clocked Tegra 4. The main current SoC flagships all have surprisingly similar CPU performance. 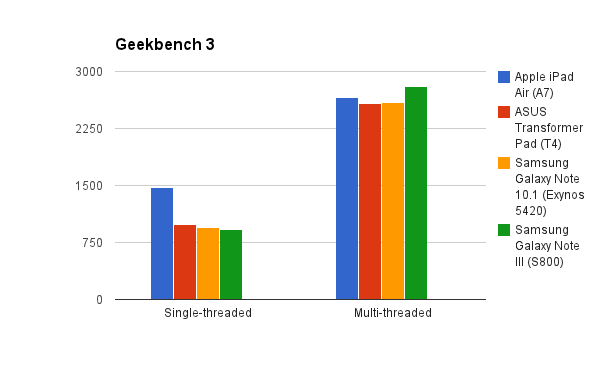 The Tegra 4, Snapdragon 800 and Exynos 5420 offer very similar single-threaded performance, despite the architectural differences between the Krait 400 core and the Cortex-A15. The only clearly distinguished competitor here is the 64-bit Apple A7, but this is out of the scope of this comparison. When it comes to heavily-threaded tasks the Tegra 4 and the Exynos 5420 are practically identical (seeing as their CPUs ARE identical), along with the Apple A7, while the Snapdragon 800 takes the lead, though not by a big margin. 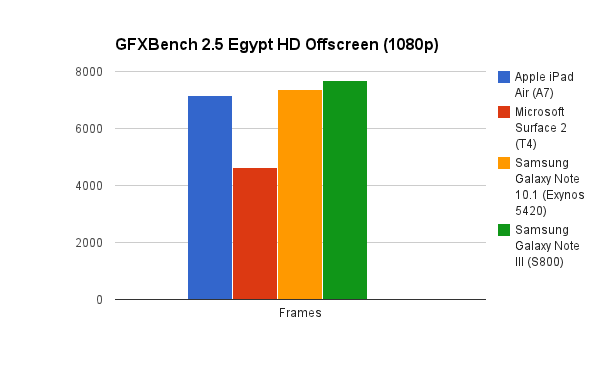 Evidently, the Galaxy Note 10.1's and the Surface 2's respective processors perform very similarly when it comes to CPU performance, so now let's check out some performance scores regarding the GPU performance with the popular cross-platform application, GFXBench. The two following tests are Offscreen test. That means that the GPU renders at a non-native, fixed 1080p resolution, so that differences between the devices' resolutions don't impact their performance. In this test the Apple A7 takes the lead, followed closely by the Snapdragon 800. The Exynos 5420-toting Note 10.1 falls a bit behind, and the Tegra 4 in the Surface 2 receives a mediocre score compared to its competitors. Thankfully, the Surface 2 has less pixels to push than the Note 10.1, which will give it a performance advantage in the onscreen tests. In this test the Snapdragon 800 and the Exynos 5420 take the lead, with the A7 hot on its heels and the Tegra 4, again, yielding a rather mediocre score. 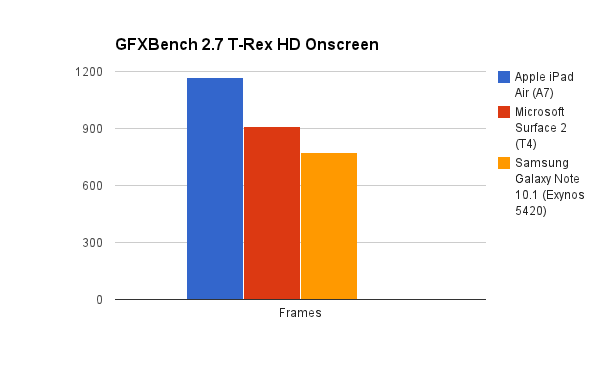 Since the Note 10.1 has to push about a couple million pixels more than the Surface 2, it was the Tegra 4 that was faster in the Onscreen T-Rex HD test, but not by as much of a huge margin as two million less pixels would otherwise imply. In fact, I expect the Snapdragon 800-powered Note 10.1 will be able to match or even outperform the Surface 2 in this test, despite having twice the resolution. From these two devices being compared, it's probably the Galaxy Note 10.1 that draws the most power. The first and most obvious cause is that it has much higher resolution screen to power. Also, while the SoC should be very power efficient due to its 28nm process (the Exynos 5420 is built on a 28nm High-K Metal Gate process, while the Snapdragon 800 uses a 28nm HPM process), but given the heavy duties that the GPU will be in charge of due to the high pixel count, it could become quite a power hog, especially when playing games. But the battery is very decently sized, which leads to Samsung's 10 hours of usage claim. The Surface 2 has, obviously, much less pixels to power, so the power consumption of the display is significantly lower. The Tegra 4 processor is also built on a 28nm process, so it won't get too hot or consume too much power when processing heavy tasks, like gaming. And while I can't compare the Surface 2's and the Galaxy Note 10.1's battery sizes directly, since Microsoft gives the battery size in watt-hours, and Samsung uses mAh, I can only compare them by estimating the Surface 2's capacity in mAh. Assuming that it's a 3.7V battery, the Surface 2 has around an 8,500 mAh capacity, which is actually slightly larger than the Samsung's 8,220 mAh battery. Then again, the battery voltage in the Surface 2 could easily not be 3.7V, which would lead to a different value altogether, but the safest bet (and that in itself isn't very safe) is 3.7V. Well, the extra thickness of the Surface 2 had to offer some advantage aside from the kickstand. Anyways, despite the lower display resolution and the (maybe) larger battery, Microsoft claims the same 10 hours of usage for the Surface 2, but in practice I'd expect the Surface 2 to outlast the Galaxy Note 10.1, even if only by a little. Of course, the Surface 2's slightly weaker specs compared to the Galaxy Note 10.1 is justified by their different prices. The entry-level 32 GB Surface 2 sells for $449, while the 16 GB Wi-Fi only Galaxy Note 10.1 has a hefty $549 price tag. That's a $100 dollar difference for the same user-available storage capacity (as the Surface 2's OS leaves it only with about 17.5 GB of free disk space). The 64 GB Surface 2 (that has about 47 GB of free space initially) matches the 16 GB Note 10.1 at $549, while the 32 GB Note 10.1 will cost you $599. So clearly these tablets are competing at different price points. The Surface 2 is hands down the best tablet for productivity. With its handy two-stage kickstand and the new backlit Touch and Type covers, which act as much as keyboards as screen covers, as well as the Windows 8.1 RT operating system and the inclusion of Microsoft Office 2013 Home and Student make it by far the most productive tablet available. However, the relatively new Windows Store has many important apps available, but is still missing some key apps, like Instagram, and has nowhere near the amount of apps that the Google Play Store and the Apple App Store offer. The Galaxy Note 10.1 2014 Edition is the polar opposite of the Surface 2. With a higher-resolution display and a very useful S-Pen stylus, as well as the vast app and media ecosystem offered by the Android OS and its associated app store, the Note 10.1 is up there with the iPad Air as one of the best tablets available for entertainment. So it really comes down to whether you want a tablet that is geared towards productivity, i.e. a laptop replacement, or a tablet that offers the best for entertainment purposes. The difference in pricing is also a factor, as many will probably find the Galaxy Note 10.1 too expensive. It's a good review. I prefer Silverlight, it's more comfortable for studying and whats up if it has not that many apps. It still works fine. Anyway, I prefer Ipad for any other reason.